"There is a common misconception that the deficits of autism automatically equate to a lack of intellectual ability." Spectrum Innovates Transition Program transcends autism’s actual deficits by engaging the passion of those on spectrum in the process of creation. The pillars of our holistic approach to transition are innovation, socialization, independence, entrepreneurship and leadership. Participants work in a real world innovation hub where the experiential learning process facilitates the unlocking of their fullest potential. Rather than an unnamed cog in the workforce, our participants will be seen as valued contributors to society. The independent living, socialization, entrepreneurship and leadership modules, integral to achieving our goal, are infused throughout the program. As a result of their engagement in the innovation hub, participants develop competency in these areas. During the final phase of the program, opportunity to achieve proficiency is provided through campus residency and work on business projects where participants may receive a stipend for their contributions. As a natural outgrowth of our mission, Spectrum Innovates’ pedagogy offers myriad research opportunities. An ideal setting for pursuit of translational research, Spectrum Innovates provides a resource for the autistic community and the world at large to reap the benefits of “theory into practice.” Through the Spectrum Innovates Innovation Experience – seminars, workshops, consultancy – educators, ASD students, business people and the wider community gain direct understanding of the model. 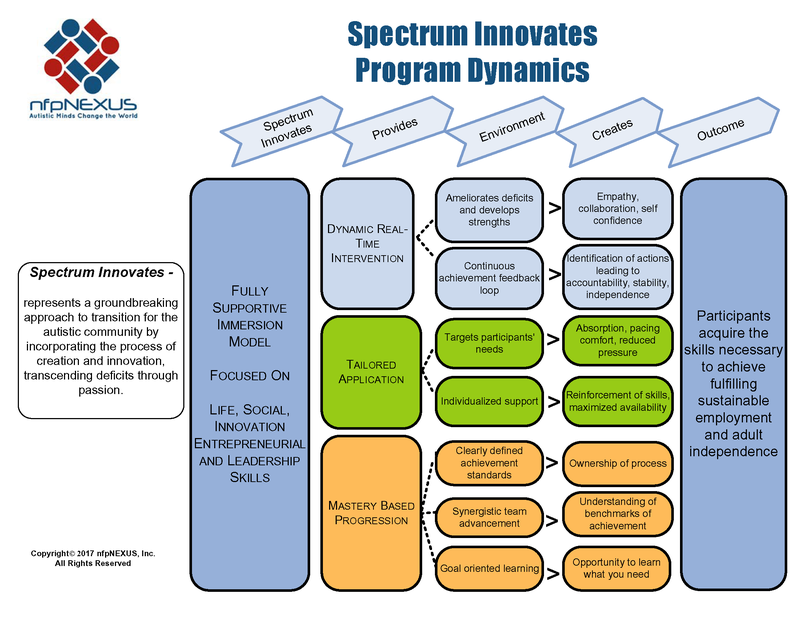 By openly sharing what we learn in the implementation of the program, there is no limit to Spectrum Innovates’ impact. If you would like a copy of our White Paper, please fill out this form to recieve a download link.